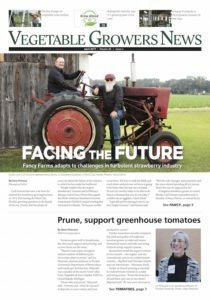 While Florida and California accounted for 76 percent of U.S. production of field-grown tomatoes in 2016, greenhouse production and use of other protected-culture technologies help extend the growing season and make production feasible in a wider variety of geographic locations. Some greenhouse production is clustered in traditional field-grown-tomato-producing states like California. However, high concentrations of greenhouses are also located in Nebraska, Minnesota, New York and other states that are not traditionalmarket leaders. Among the benefits that greenhouse tomato producers can realize are greater market access both in the off-season and in northern retail produce markets, better product consistency, and improved yields. These benefits make greenhouse tomato production an increasingly attractive alternative to field production despite higher production costs. In addition to domestic production, a significant share of U.S. consumption of greenhouse tomatoes is satisfied by imports. In 2004, U.S., Mexican, and Canadian growers each contributed about 300 million pounds of greenhouse tomatoes annually to the U.S. fresh tomato market. Since then, Mexico’s share of the greenhouse tomato market has grown sharply, accounting for almost 84 percent (1.8 billion pounds) of the greenhouse volume coming into the U.S. market. This chart appears in the ERS report “Unpacking the Growth in Per Capita Availability of Fresh Market Tomatoes,” released in March 2019.